BIRMINGHAM – Oxford won the Class 6A Super Sectional for the third year in a row – but first in the North – and the Calhoun, Cleburne and Talladega area qualified a total of 61 wrestlers for next week’s state finals on the second day of sectional wrestling at venues in Birmingham and Montgomery. The Yellow Jackets added the third leg of this wrestling grand slam (County, State Duals, Sectionals, State) with 181.5 points, just 3.5 ahead of runner-up Clay-Chalkville. It was the first time during this run of sectional titles they won it from the North at the Birmingham Crossplex. Landon Burrage (126) and Reed Hill (152) both brought individual titles to Oxford, but the Yellow Jackets had four other wrestlers make the finals with three losing close decisions and the other getting pinned. Still, the Jackets qualified 10 wrestlers total for the championship meet next week in Huntsville, which Routon said gives them a chance to win a third straight state title in what he suspects will be one of the tightest if not lowest-scoring finals in the history of the tournament. But they will be missing a key piece as they chase a third straight state title, as 138 Chase Hicks missed the sectional for disciplinary reasons and won’t be competing at the VonBraun Center. He was the middle piece in the Jackets’ ‘Gang of Five” in the middle of the lineup starting at 126, all of whom were expected to vie for state titles. In their championship matches, Burrage scored an 8-6 decision over Gardendale’s Devyn Scoggins and Hill pinned Jason Minchew of Shades Valley in 3:31. Oxford’s other finalists who weren’t as fortunate in the finals were Wesley Slick (132), Jakob Chisolm (145), Kendrick Young (170) and Kobe Shumaker (220). Routon is confident they’ll put that disappointment behind them and use it as motivation going forward. “It’s kind of like when you see good teams in college football if they lose a game the next Saturday the poor soul they have to play against they usually get beat up pretty bad,” Routon said. “I do feel that’s how (they) will take it. 195: A.J. Talton, Clay-Chalkville (42-1) dec. over Riley Kuhn, Fort Payne (42-6), 6-1.Other qualifier: 4. Octavius Adair, Oxford. 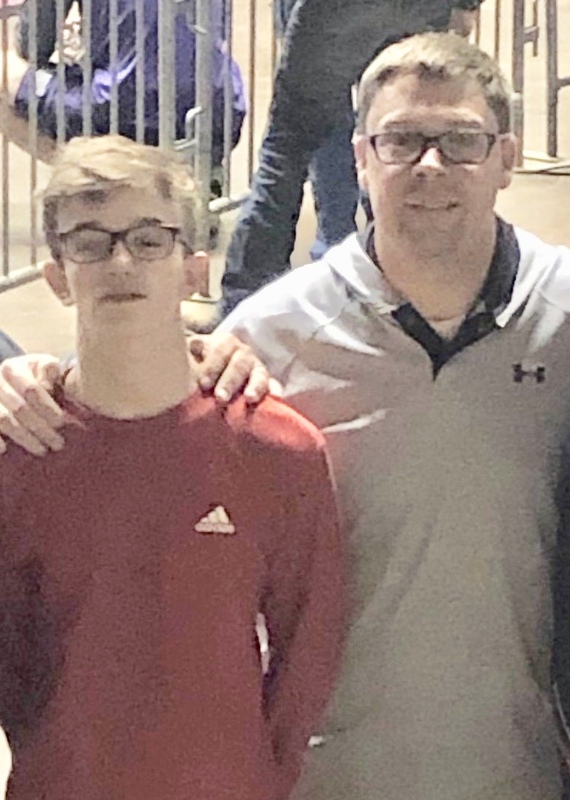 MONTGOMERY – Travis Bellar admitted he was hesitant at first when the Weaver wrestling coaches approached him a couple weeks ago about dropping back to 106 from the 113 class he was used to competing in. Travis Bellar (L) stands with Weaver wrestling coach Andy Fulmer after becoming a state sectional champion Saturday. It was such a hassle, but the junior couldn’t have been happier he pulled the trigger after he won the weight division in the Class 1A-5A South Super Sectionals at the Garrett Coliseum for his first varsity tournament title. Bellar was the first of eight wrestlers from Calhoun, Cleburne and Talladega counties to bring home titles from here and among 51 wrestlers to qualify for next week’s state championship meet. He went 5-0 with all first-period pins, none lasting longer than the 1:37 it took to drop Tennison Norton of Saint James in the championship match. He had the most pins in the 1A-5A sectional. Bellar did win a junior varsity tournament earlier this year and probably would have qualified for Huntsville even if he hadn’t dropped back a weight class but fate only knows if he would’ve gone as a section champion. He wrestled at 106 for the first time in the Bearcats’ final duals date of the season and lost both matches to wrestlers from Oxford and Spain Park. Still, he was seeded second in the weight class this weekend. “I didn’t think I would make it this far,” Bellar said. “A couple months ago I was at 113 just wrestling and coach brought up to me about going to 106. He thought it was a good idea and thought I could do better there. Fulmer was “really excited” for Bellar for all the things he has overcome. The other individual champions from the area here were Bellar’s Weaver teammate Caleb Allison (220); Alexandria’s triple threat of Fletcher Swindall (126), Jaden New (132) and Christian Knop (195); Cleburne County’s Shane Beason (138) and Zachary Williamson (152); and Piedmont’s Evan Cooper (285). Alexandria finished second in the team race, 60 points behind champion Saint James and seven points ahead of third-place finisher Ranburne. New edged Weaver’s Cody Souder 5-4 in one of the best matches of the day. Knop went 4-0 with three first-period pins and his 13-6 decision over Ranburne’s Christian Smith in his final; he now has 317 career wins and 231 in a row. Allison pinned all three of his opponents to extend his career record to 320 wins. Team scores: St. James 263, Alexandria 203, Ranburne 197, Tallassee 193, Cleburne County 166, Elmore County 148, Weaver 134, Beauregard 130, Piedmont 104.5, Montevallo 85, Pike Road 79.5, Lincoln 78.5, Prattville Christian 76.5, White Plains 75, Montgomery Catholic 64, Shelby County 63, American Christian 58, Thomasville 49.5, ASB 48, Satsuma 44, Wellborn 43, Pleasant Valley 42, Beulah 39, Holtville 33.5, Brewbaker Tech 30, Talladega 27.5, Ohatchee 23, Dadeville 19, Charles Henderson 18, Saks 18, Reeltown 14, Elberta 11, Houston Academy 4. ← Previous Story Why not us?